A large number of medical negligence claims for compensation are brought for shocking, but common, surgical errors. Theoretically, these are errors which should never happen, and this is why they feature on the NHS’s ‘never events’ list. This is a list of serious but preventable medical mistakes that have led to a patient suffering serious pain or injury. Incidents are known as ‘never events’ if something avoidable goes wrong during medical treatment, causing severe harm – or even death – to a patient. If you or a loved one has suffered one of these errors, it’s very likely that we will be able to assist you with a claim for compensation for medical negligence. Wrong site: this is when surgery is performed on the wrong patient or on the wrong part of the body. If a patient is wrongly identified and undergoes surgery they don’t need, the consequences can be devastating, not only for the patient undergoing the surgery but also for the patient who was supposed to be treated. If surgery is performed on the wrong area of the patient’s body – for example if the wrong leg is amputated or the wrong kidney removed – this failure can also have devastating, even fatal, results.However this group excludes incidents where the surgery was performed on the wrong site because of incorrect laboratory reports or incorrect referral letters. It also excludes interventions where the wrong site had to be selected because of an unknown or unexpected abnormality in the patient’s body. Wrong implant or prosthesis: this is where a doctor inserts an implant or prosthesis incorrectly, so that further surgery is needed. For example, if an incorrect implant is used in breast augmentation surgery, or a prosthetic kneecap meant for the right leg is put into the left leg, the patient must have yet more surgery to correct this.However this does not include incidents where the implant or prosthesis has been intentionally placed in a different place than the surgical plan, based on the doctor’s judgement at the time of the surgery. Retained foreign object: this is when a foreign object or instrument is left inside the patient after surgery. Surgeons use many surgical instruments and objects during an operation and they have a checklist at the start of each operation to show what instruments and other items will be used. At the end of the operation, the same list needs to be rechecked to make sure everything is accounted for. If this doesn’t happen, an item may be left inside a patient’s body by accident. (This can include things like swabs and needles as well as medical instruments.) The missing item is often not noticed until after the operation, when the patient is out of theatre and then suffers pain or an infection. 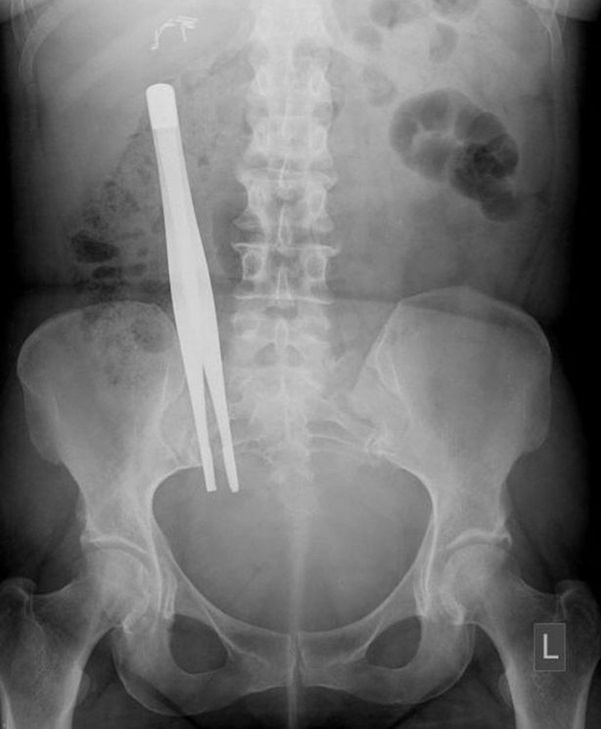 Further surgery is almost always needed to remove the item left behind.However this does not include incidents where an item is intentionally left in with the plan to remove it afterwards, and this is clearly documented in the patient’s medical records. It also does not include incidents where items are known to be missing prior to the completion of surgery (such as screw fragments, drill bits) and may be within the patient but further action to locate these would either be impossible or cause more damage to the patient then leaving the items behind. 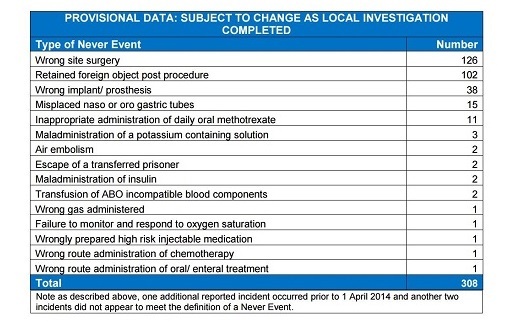 A ‘never event’ almost always leads to more pain, scarring or a longer recovery period for the patient, and it’s easy to see why the Department of Health feels that these incidents should never happen. The ‘never events’ list is issued annually to all NHS health professionals, who have a duty to report any incidents that they believe may be a ‘never event’. Failure to identify abnormalities during exploratory procedures. Sometimes an exploratory operation is done to confirm a diagnosis. For example, a laparoscopy (keyhole surgery, which is less invasive than traditional surgery) is often performed to confirm a suspected problem such as endometriosis. Unfortunately, a doctor carrying out these procedures may either fail to check for the condition suspected or fail to record another condition they subsequently find. Avoidable damage to tissue, nerves and muscle. Medical instruments are sharp and can cause significant injuries to a patient, such as excessive bleeding or irreparable damage to organs, so that the patient needs further treatment. Hospital-acquired infections such as MRSA, E. coli or C. difficile. Being in hospital is an unpleasant experience anyway, and the last thing a patient wants is to suffer more harm due to the hospital’s failings. Poor hygiene or infection control (such as not sterilizing equipment properly) can lead to patients acquiring infections during or after surgery. This can happen to anyone anywhere in hospital, with newborns and the elderly most vulnerable. Infections are most common in intensive-care units and on surgical wards. If you have suffered harm as a result of any of these events, it’s very likely that you will have a claim for medical negligence. Whilst we attempt to obtain an apology or explanation for why you suffered the incident, the ultimate aim of a claim will be compensation. Compensation seeks to put you back in the position you would have been in had your treatment been appropriate. The level of compensation will therefore depend on the extent of your injuries due to the negligence and any financial losses as a result of them. As specialist medical negligence solicitors, we understand that surgery is difficult and painful enough, and that if things go wrong it can be devastating for you and your family. We can provide both legal advice and access to practical support services to help you cope physically and emotionally. If you wish to pursue a compensation claim for a surgical error, it’s important to instruct a specialist medical negligence solicitor. I am a medical negligence Senior Solicitor at Bolt Burdon Kemp with experience of claims involving surgical errors. If you or a loved one are concerned about the treatment you have received, contact me, Ipek Tugcu, free of charge and in confidence on 020 7288 4849 or at ipektugcu@boltburdonkemp.co.uk for specialist legal advice. Alternatively, you can complete this form and one of the solicitors in the Medical Negligence team will contact you. Find out more about the team here.